I've just finished putting together some tips and techniques for this FREE Spinning Blooms Mini Quilt pattern now available over on my MAKE page! 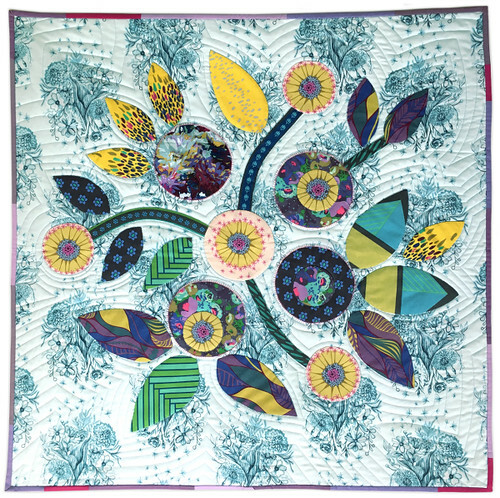 It uses many of the exact shapes from the Folk Flower Quilt in a new compact arrangement. 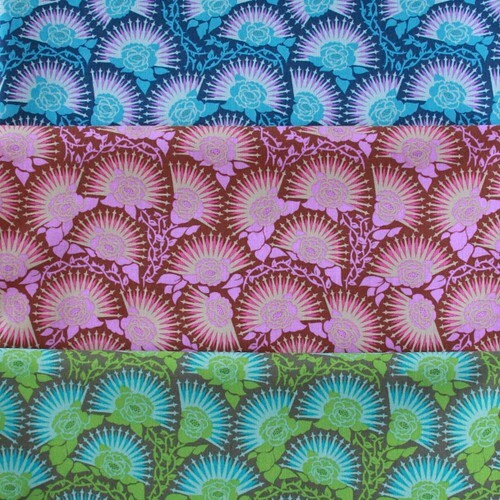 And we are all stocked on Mod Corsage in the shop if you fancy a look at this color way or another. Hello there! This year I am so happy to be participating in Creativebug's BOM series along with Heather Jones & Carolyn Friedlander. Every month we are taking turns sharing a block design that you can learn from our video classes at their site. (They have a few different options for joining/viewing but both REALLY reasonable). 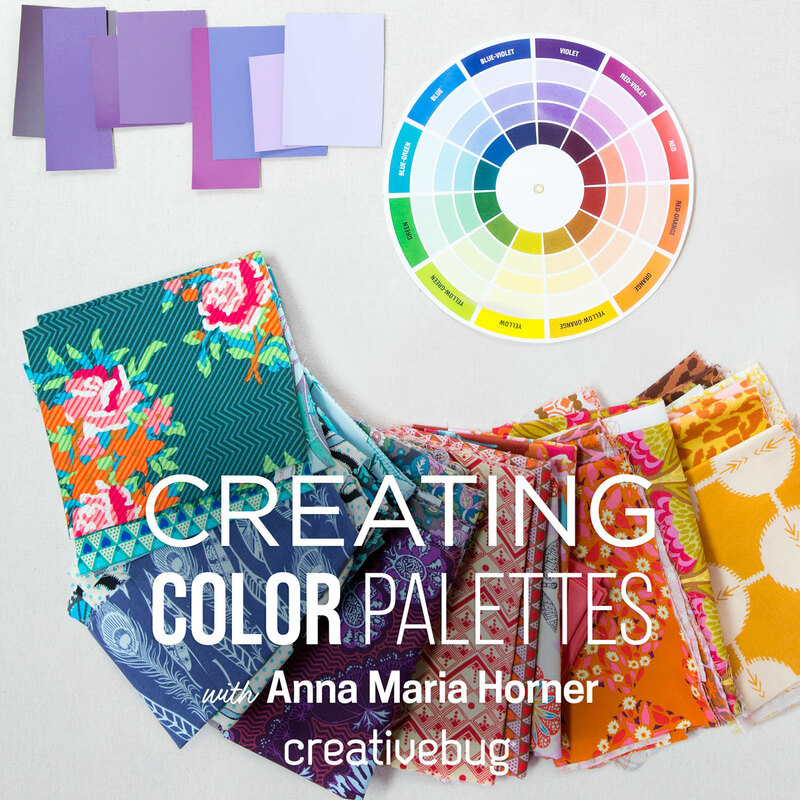 Anyhoo, bc I am such a Creativebug fan & supporter, I worked with them through Craft South to create a monthly quilt kit program that corresponds with the block of the month. 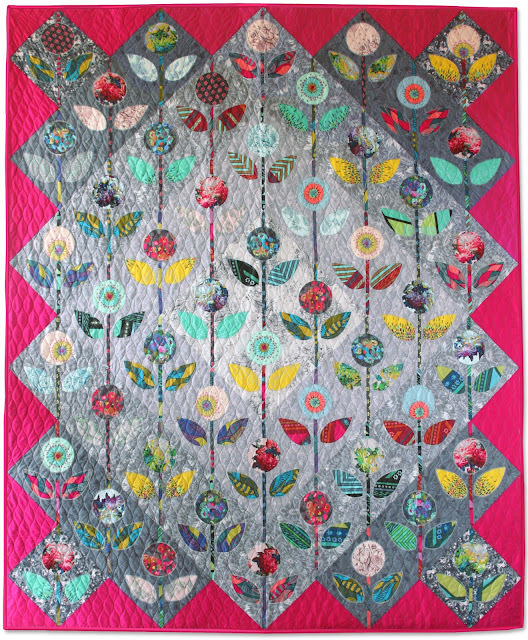 For May I created the Folk Flower block, and I used the block design to create a big stinking quilt as you see above. 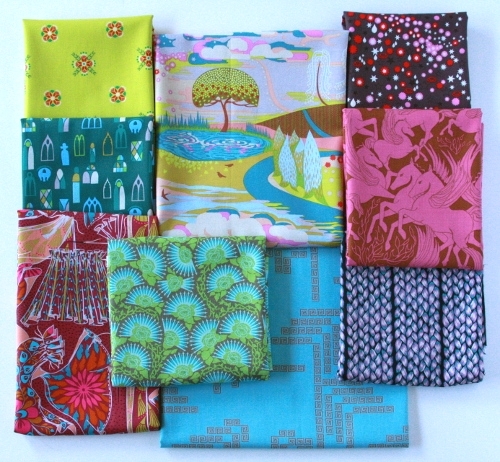 And we now have the kits ready to go in the Craft South online shop! 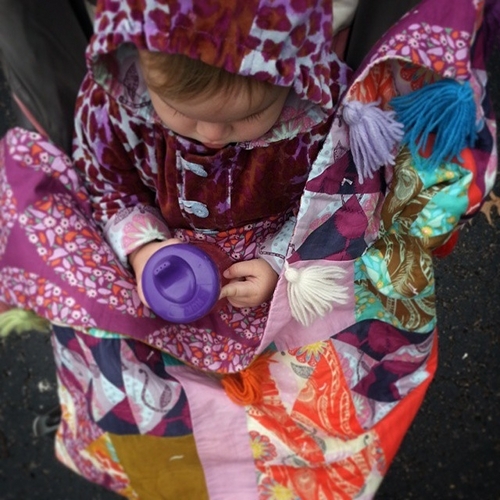 This is one of my favorite quilts ever, if I do say so myself, and I am excited to see other variations! I have written more notes about going from learning the machine applique block (way easier than you might think, I promise) to creating the quilt. SO hop over to the Craft South blog for that info, if you please. One of my favorite personal projects is a patchwork design called Mod Corsage where I've drawn inspiration from vintage Broderie Perse applique but put a modern, straight-line spin on the bouquet building. An exciting part of creating these somewhat improvisational, patchwork bouquets is sourcing the best fabrics for the floral, stem/leaf and background elements of the design. 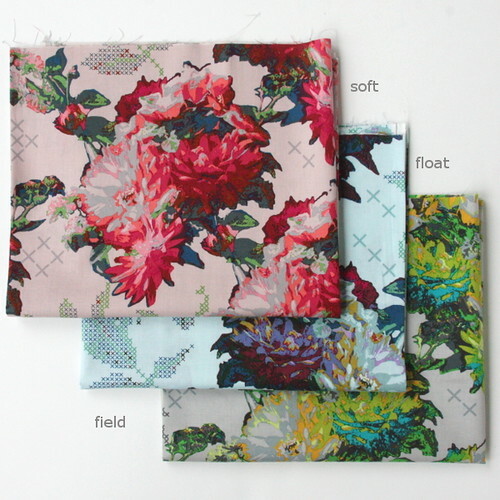 As a designer who never tires of floral themes, it occurred to me that these three, simple categories were a perfect direction to base an entire fabric collection. Mod Corsage offers bright, illustrative bouquet scenes with vintage flair as well as softer, more traditional floral renderings for balance. There are quirky, modern geometrics with high and low drama, and plenty of floral component pops here and there to build bouquets across all patchwork traditions. 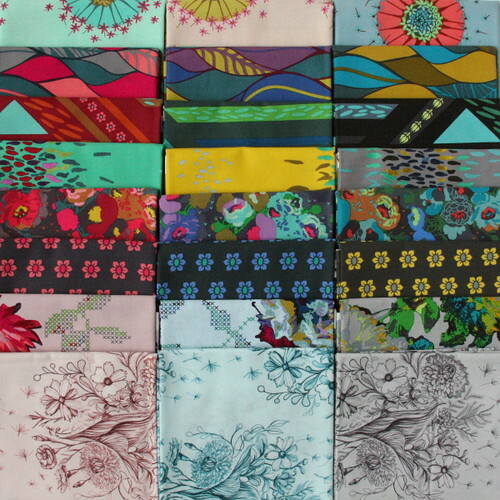 And, of course, so many of the fabrics are gorgeous stand-alone pieces perfect for fashion, accessory and home projects. 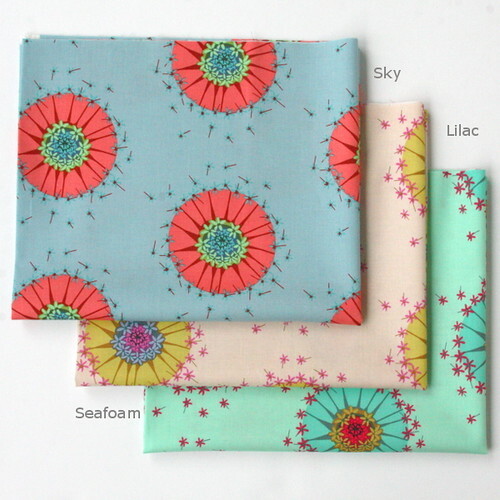 Mod Corsage is everything I love about patchwork, flowers and color all rolled into one collection! 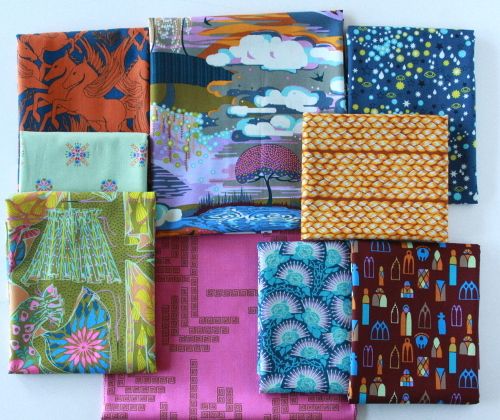 In some ways this collection feels like one that I have been meaning to make every time I sit down to design fabric. That feeling happens once about every 5 or 6 collections... and I think it has something to do with purely expressing what I find beautiful. And what makes my hands want to draw. This is also a collection of process FIRSTS for me. The above print, Memory, is the first time I have ever digitally altered a photograph to create a print. 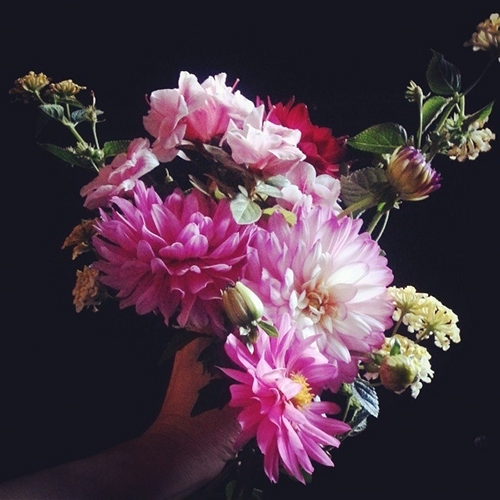 Here is the bouquet photo shot taken a few years ago on my phone that started this print. Though this print probably would have gone much faster had I drawn it, I am really digging the different feel that it has. Another process first is this hand-drawn print, that was simply created by sitting on the front porch of my house and making a drawn bouquet out of everything that I saw blooming around mid-June of last year. And I turned in more a drawing, and not a very perfected digital file, as I normally do, with flattened color. I was interested in testing out the subtle print boundaries of the mill and how the screens would come out as they tried to match the roughness of graphite. I love this one. It feels so close to my sketchbook, that I have a tenderness towards it. 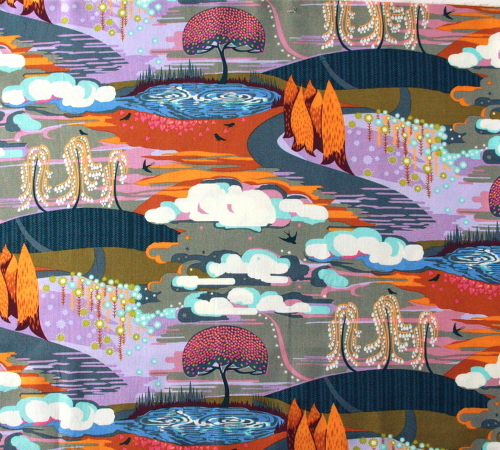 If one can have a tenderness towards a piece of fabric. Here's a pretty usage. And the remaining process first, is this watercolor print. Again leaving the nuances of color as they existed in the original painting, and therefore leaving a bit to chance. This one has such wonderful fussy cutting opportunities, as well as whole piece interest. Likely the most groovy of all of the prints both in form and color is this guy. 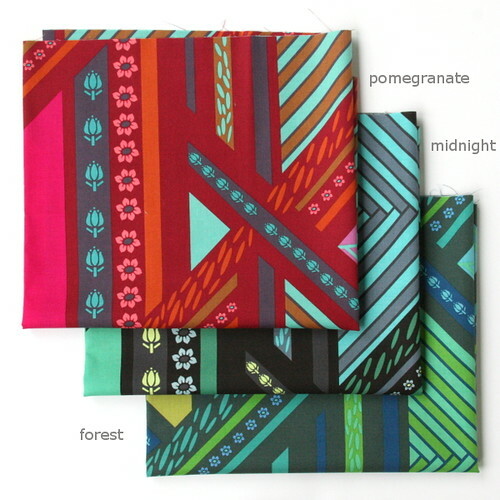 Really fun for fussy cutting too, or a mod dash of off beat color for garments. Oh this is the fussiest of all the fussy cutting opportunities in the whole collection, but again great for full garments, bag and home decor uses. Really large scale repeat, but section by section, has elements of ribbon like stripes on grain & bias, and triangular solid and woven bits too. 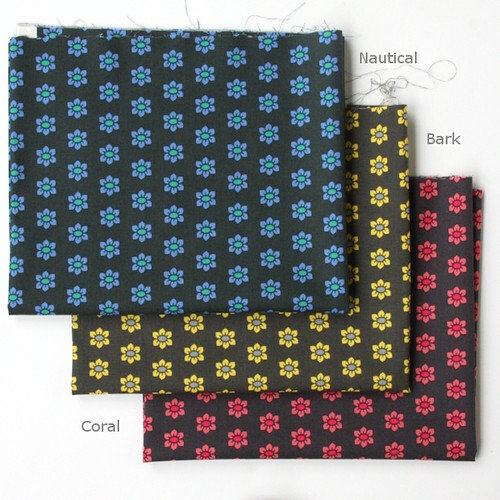 I've already used this one a whole lot for bias stems in applique. 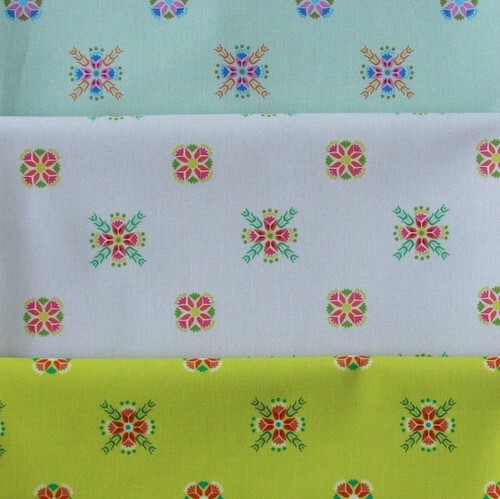 This has such a happy small-to-mid scale rich floral appeal, and I am itching to make Miss Mary Anna some sweet summer dresses or shorts out of all of these. 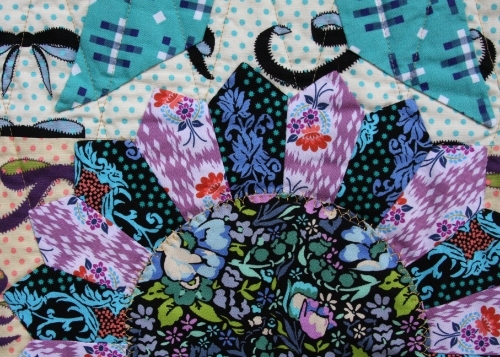 This print was created with one thing in mind and that was to provide the pretty center to any sort of flower one might want to build in patchwork, whether fussy, applique, improv.... but the space of color that I left between the "centers" makes for a feminine but modern field of pretty. It popped up in my Instagram stream a bunch as I was working on my patchwork projects for Quilt Market a few weeks ago. After working with it so much it started to feel like eyeballs. Lolz. A sweet, simple, iconic floral, that we all know may get used more than anything. 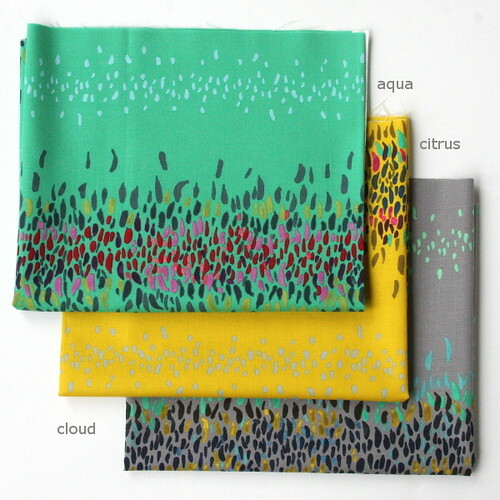 An ironic truth to designing fabrics that I have finally and happily come to terms with. 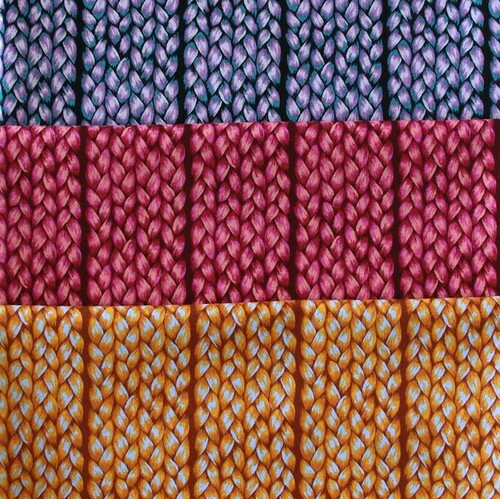 There is still a trick to getting them just right though, the really simple fabrics, I am happy with the way this one turned out. So much so that I had decals made for the floor of my quilt market booth! A sad moment to peel up and discard after the show was over! Thaaank you for making it this far with me. 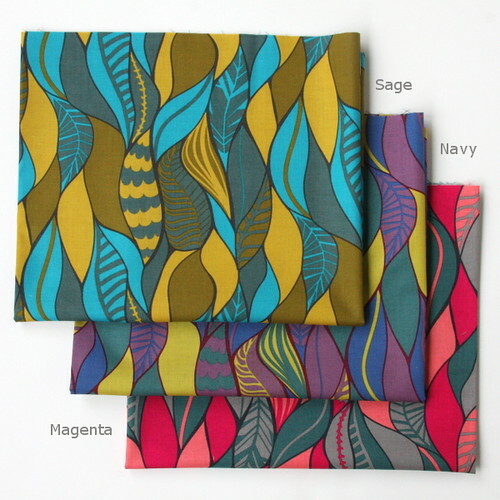 To the end of this blog post and the 10 years I've been designing fabrics! 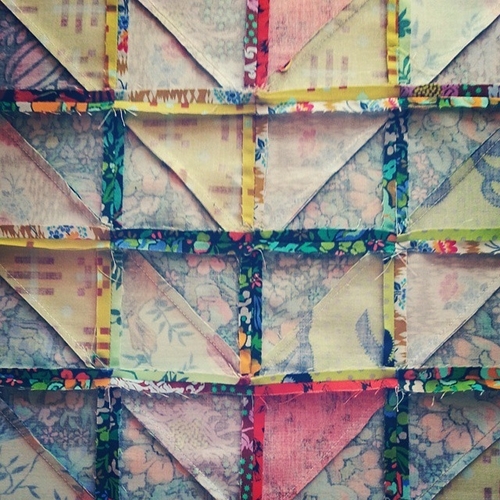 Back soon w some pretty patchwork! The last several months have been ripe with daily discoveries in my work, my motherhood, my hopes and my art. Failures. Frustrations. Joys. Fears. Unreasonable hopes, and many almost-just-right successes. Since we opened Craft South in May of last year my schedule has been free of the more predictable format that the previous ten years have enjoyed. In most sentences the word "free" implies something good. Here, well, I suppose it is all a matter of how you look at it. I am learning so much about what it means balance family and work. So much. I thought I knew, and then I realized that I had no idea until I threw a really heavy weight on one side of that scale. For months, I have been pushing my foot down on the family side as hard as I can to weight the scale in favor of the people that I love, but not lose sight of the work that I love. I suppose the greatest goal that I have is that the family can support me, and that the work will support my family, not just tangibly, but as a positive force. That is it, right? I think so. I am so very grateful for both, but which of us professes that gratitude of motherhood while you are being puked on? No hands? Right. Well, I suppose the work gratitude is the same. It does puke on you. Then later you realize how lucky you are to be puked on. What was I saying? Since 2009 I have written a January recap of the previous year, and this year, I just could not muster the strength to see 2015 for what it was..... it seemed so many years all in one. Our family life with all of it's ages, directions, personalities seems to have grown bigger than any summary I can attach to it.... my work life too, has sprouted arms and legs and is running in directions that I am still trying to have the lung capacity for, but I remain engaged and excited about the changes. I suppose I am still learning how to succinctly talk about it in bits here, and like many of us, I am trickling so many words and images through Instagram on an almost daily basis that I wonder about redundancy and all that. I guess, placing thoughts here, is not redundant as much as it is just a different investment, and all together different piece of writing to look back on... and maybe less affected by the .25 second attention between the finger swipe of all the other images and words and #s. Ahhh. Slow. Down. Us. I love Us. But I want Us to slow down. If I CAN attach a single thought to 2015, and even the past few months, it is that I was forced to realize how much slower and in person is good. My home became free of an online shipping process that made it belong to my family in a way that it has not since 2007. That made each moment here a more dedicated moment. 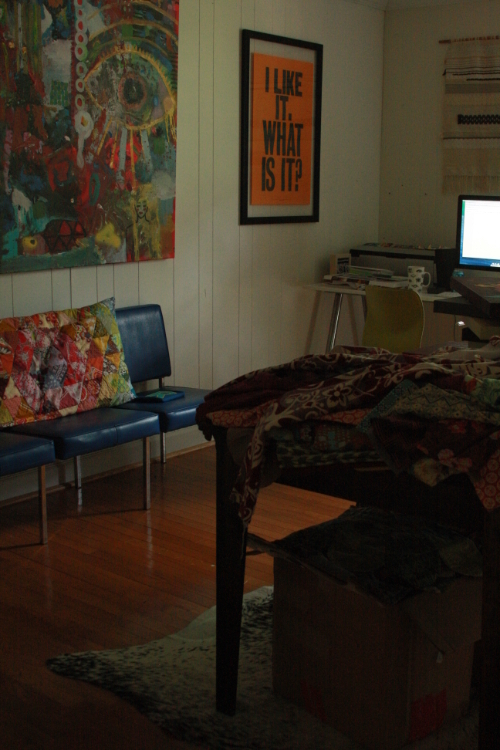 So even the work that I invest in my home studio is now quieter, albeit busier with the addition of Craft South. But that place, which is just about 10 minutes from my house.... it is a place for me to walk into where I engage my own craft and that of others in a tangible way, that is not a screen or a hashtag, or a FB post or an IG promotion. 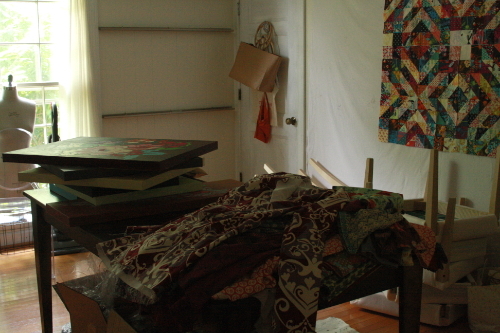 Craft South is people and processes that I can see, and smell and hear, and feel a part of. So the work and the home are better because of 2015. Not easier. But better. I hope that the investment in the places above helps if you miss me here. When I am conducting my days, I often think about this place and the voices that have so kindly responded to me here since 2006. And the collective support that I still feel, despite my long stretches of silence, is a meaningful part of my creative conscience, so thank you for that. 2016, so far so good, you. 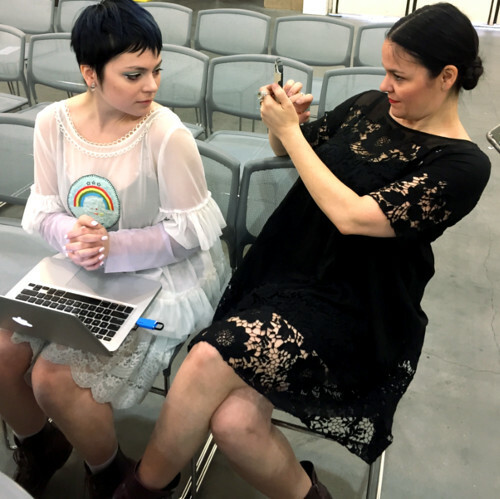 The image above reflects a very nice reward for the years of investment in my career and my family..... it is me as the proud mama of a gorgeous, talented girl, who just presented her first collection of fabric with Free Spirit while we were @ Quilt Con last week. Miss Juliana, you are a rare and wonderful person, and you can do whatever you wish with your gift, because it is an honest and beautiful gift. I am so happy that I watched your first official introduction to this industry on my mother's birthday. I know that she is so proud of you, because I feel it pour right through my heart to you. "Fibs & Fables was inspired by my interest in and love for vintage fairytale illustrations and I have never had more fun doing research. The notion of storytelling, in a sense, is a system of make-believe with various motives: to teach a lesson, to entertain or to perpetuate a culture's belief system. And perhaps in a more cynical sense, stories are just fibs- but when set to beautiful images....they are welcome lies. Exploring old German, Danish, British and American illustrations revealed all of the beloved book scenery that I got lost in as a child. Many of those artists were themselves influenced by ancient artwork, ancient stories and Greek Mythology. What entranced and inspired my color directions was the element of fear and tragedy combined with joyful resolutions. The balance of the two, as well as the good and evil that is such a common theme helped me to cast a moody palette on the fabric's color ways. The prints themselves are a not so literal in telling any specific fib, fable or fairytale, but rather bring to light the elements that exist in so many of our favorite stories. 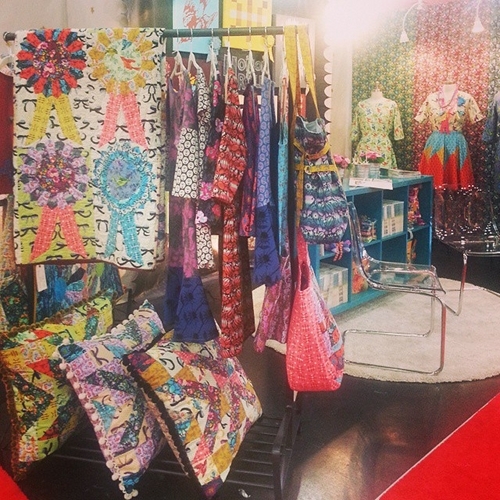 The collection is as fun for children's quilts, decor and clothing as it is unexpected for women's fashion." I will further say that for someone who is not so much a novelty print designer, I found the fairytale theme a unique challenge. And I can't say that I was inspired by any one fairytale or set of characters as much as I was inspired by the art that has told those stories over centuries. I therefore sometimes shifted my focus to present imagery in a less literal way, but still include elements that act as the building blocks that can tell many stories at once. So shall we have a look at the prints? A described above, I was as interested in peripheral imagery, and I suppose you can say that rather than having a print portrayal of a clock striking twelve, I have the above gem. Church windows, castle windows, tower windows, yes this is much more literal. But my focus here is on the possibility of escape from dark to light, as seen through the windows. You just have to figure out which one you fit through. I of course had to give a nod to Greek mythology.... but I was really only inspired to do so in this collection when I found so many illustrators over the past two centuries doing the same in their work. 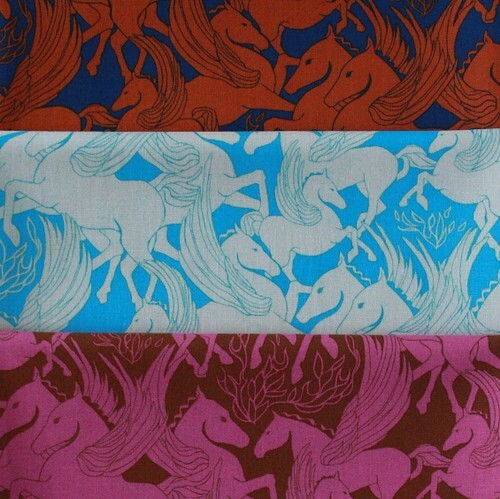 Helios was imagined to be the god of the sun and he lit up the sky each night with four winged, fire-breathing horses. And who wouldn't want to draw that? Drawing horses is such a connection to my childhood that it was a welcome theme. 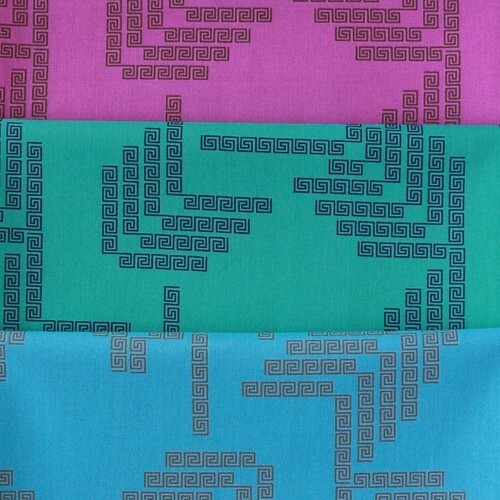 This one will also come in three colors of Rayon Challis. 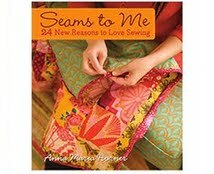 So many of my favorite stories as a child had an element of making- the spinning wheel in Sleeping Beauty, the humble dress made by little creatures in Cinderella, the invisible garment in the Emperor's New Clothes.... so I paired those ideas with the culture of dressmaking and tailoring that and set them to a seemingly magic wand of a needle doing the work without hands. This one is a sweet representation of folk art styles found in many German and Dutch fairytale illustrations and to me it feels reminiscent of cozy interior spaces and kettles and dishes. I was obsessed with drawing characters with braids when I was a girl. I loved having to re-figure out how to do it every time. I really enjoy how equally weird and normal this print can be. Only weird when you imagine it to be hair, but more normal if you have baskets on the mind. I suppose you could call this my wish upon a star print. Eyes, tears, stars. 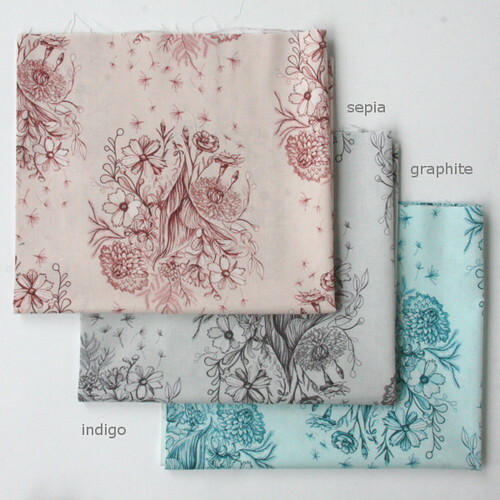 It is a tiny little print and this one will be in Rayon Challis as well. And if a fairytale is a depiction of struggle from start to resolution, I loved the idea of including some sort of a maze-like print. I had originally thought of hedge mazes, but that was less interesting to me visually, so I was messing around with meandering designs. 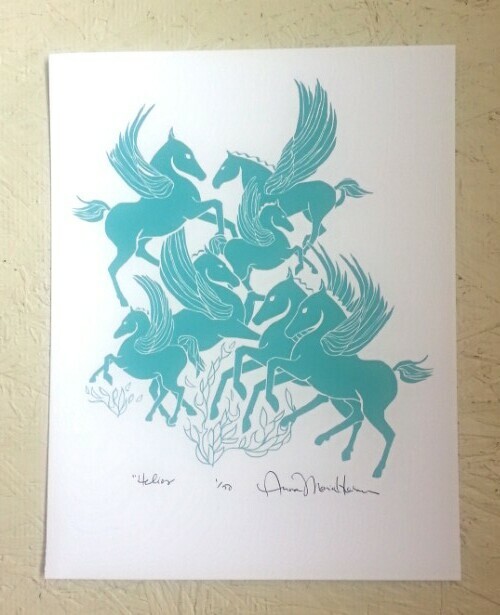 Then when researching ancient Greek art to develop the Helios print, the Greek key design was waving at me. It was saying DUH. Well OF COURSE I had to do a landscape. What good fairytale book was without some sort of landscape? Aside from that, I have always been intrigued (terrified) of developing a landscape image into a repeat. I presents a very unique set of challenges that other prints do not. 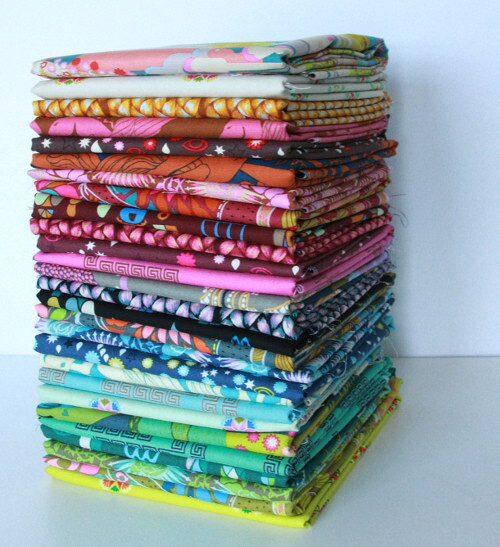 I've shown what an almost fat quarter looks like above so that you can see how it all comes together. I will admit this one took me FOREVER. Resolving how elements came together on all sides proved quite tricky (lots of walking away) and but then extremely rewarding once I let go of reality. Stars become flowers. Roadways lead to clouds. Clouds become water. Sky becomes ground. And weeping willows grow tears instead of leaves. And the whole of it is guarded by a flight of swallows (how could I not pay homage to Thumbelina?) If you follow me on Instagram you might remember that when I was first sketching this print (in my bedroom mind you) that a bird practically landed on my shoulder who must have gotten in the house and was hiding under my bed. Yep. 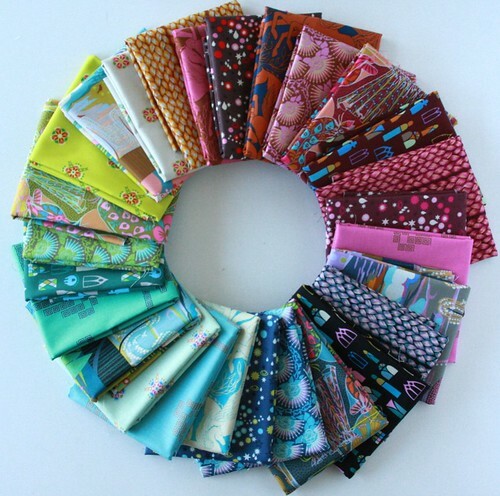 There are a total of 27 pieces in the quilting cotton collection, and I have been working on some very fun sewing for the upcoming fall Quilt Market which I'll be sharing in the coming weeks. 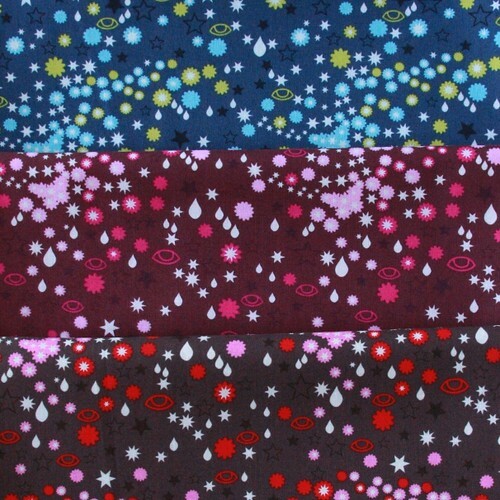 As mentioned above there will also be 6 Rayon Challis pieces, that I have already been making clothes out of! Beginning on Monday of next week, my online shop will be pre-selling full collection stacks of Fibs & Fables which should ship out the first week in November!!! And to celebrate the launch, anyone who pre-orders a full collection stack from my shop will receive a free limited run fine art print of Helios, shown above measuring 8.5x11". Perks, people! We will send out a note with a shop link along with some other studio news on Monday morning, so be sure you are on my mailing list! I hope you love this collection as much as I loved creating it for you! UPSTAIRS: So the upstairs suffered a tornado of a move out- rifling through with no time to spare to get Craft South open on schedule. There was a luxury to throwing everything around in whatever ridiculous manner I cared to, knowing that I was going to be the only one putting it all back together again. Thinking of it now, I was so very uncareful and thoughtless about tossing here and there. And now the first reentry into that space since we opened the shop (dreadful as the air conditioning is on the fritz up there) has been to assemble all of my Summer Rummage Sale items. 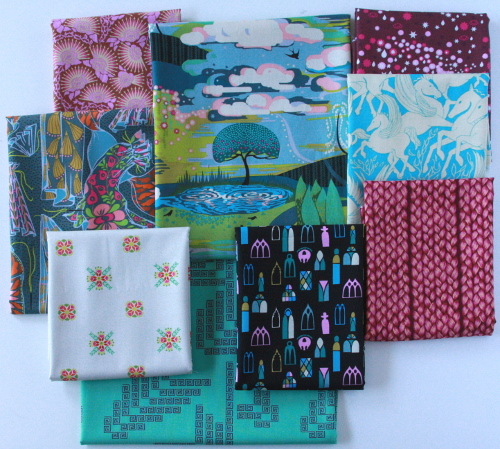 There is loads that I have been anxious to send to a happy home (still some available after listing this morning!) but I have only been able to work up there for 30 or 45 minutes at a time-bc of the heat- rummaging and photographing the goods. Sweat. It feels so large and cavernous despite the mess now. I am rethinking completely how I want the room to be put back together. 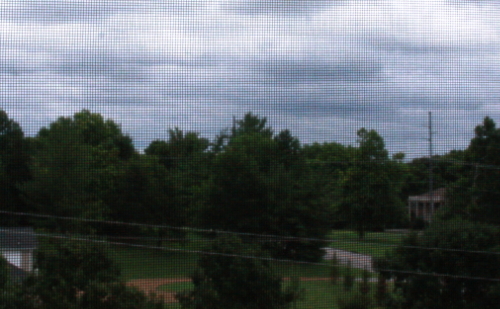 I had always rather liked Pierrette's view of the neighborhood hills, and wonder if I might move a desk over there. Or maybe my drafting table. You can hear the neighbor's chickens better from there. 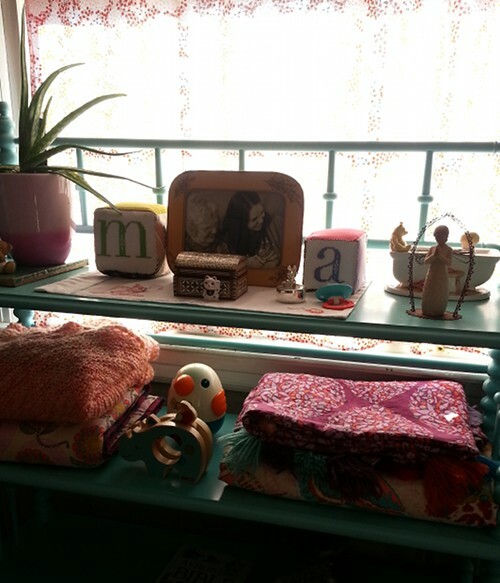 Or perhaps a second sewing machine set-up that is always ready for machine quilting and larger projects, while keeping small project sewing at the current sewing spot. I haven't had a couch up there ever since I began sharing the room and wondering if I have room now for maybe just a wingback. My priorities right now are to get the air conditioning fixed then send my sister a plane ticket so we can sit on the floor and talk about how it should be, get about half done then abandon it for cooking and movies. Goals. DOWNSTAIRS: This has been the biggest change. It went from being a giant fabric cutting table and shipping supplies and bolt after bolt after bolt of fabric to being almost completely empty. So empty that I had to mock up a "studio" last month when my Janome crew came to shoot new class videos. Which was actually sorta fun. My hopes for this space are that it get reclaimed by everyone, not really me. 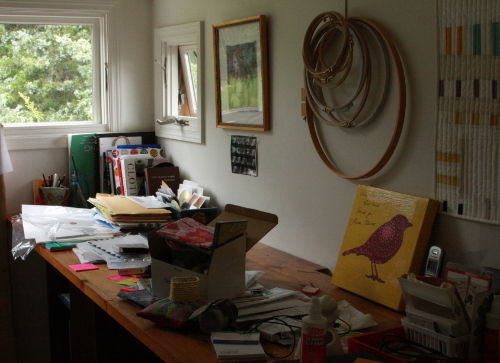 We, like I am sure many of you, do SO much of our everything at the dining room table. Homework. Art. Food. Visiting. Nonsense. So that started me thinking maybe we can have a whole room for all that instead. And I am working on it. A 6 foot table has been procured. One hide has been snatched up to keep feet on something soft and warm while homeworking. A smallish waiting room style, midcentury sofa in electric blue vinyl has also been invited to help us out. The family painting we did together last summer has been hung where it was always meant to be. A favorite art print appropriately landed right next to it. 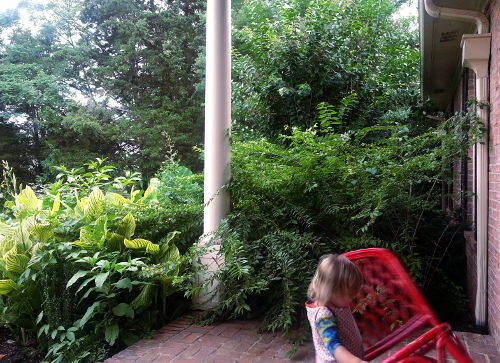 AS IT IS NOW: The table needs chairs. Some of which I have but they need to be covered. Until my air conditioning is fixed upstairs, my computer, myself, and -today- loads of rummage sale items and other works in progress are in here too. While I am looking forward to reawakening my dream studio upstairs, for now I am happy to be closer to everyone down here, saving them the walk up to me, and slightly going mad from the chaos that summer can be. Though this week we have whittled all the way down to the 2 youngest with the 4 older at camp. So I can hear Mary Anna's nap breathing through the wall and Roman's crayons across paper right now and that is all. Well, and my keyboard. 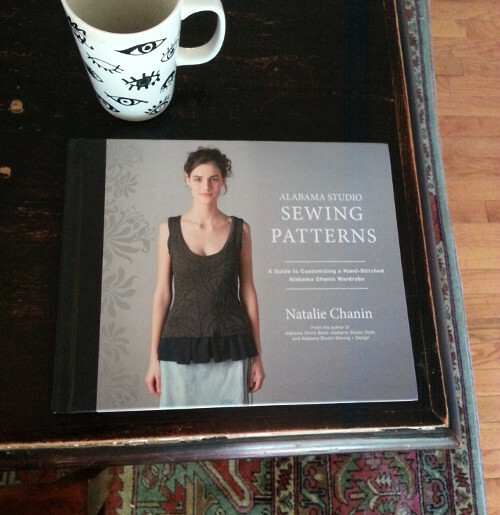 A million years ago (2010) I first wrote a review on Natalie Chanin's then new book, Studio Style, and today I have the pleasure again of digging into her latest work, Alabama Studio Sewing Patterns, to share my insights. What has me feeling like the luckiest girl though, is that the process of this sharing involved having a custom garment made and photographed on moi. Oh the work. It is so hard. I suffer. 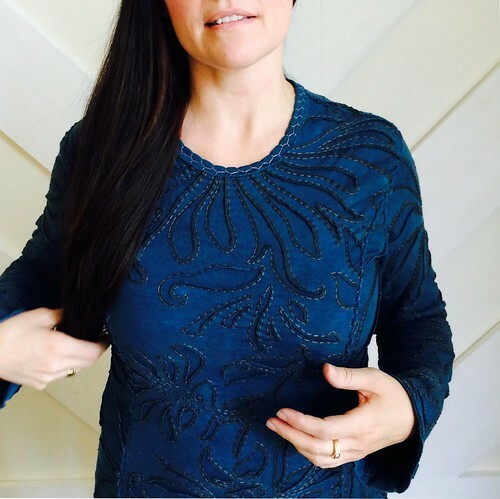 I said then, a million years ago, and I say now, that my friend Natalie does not design clothing, she also builds it. He process of creating the imagery on her organic cottons is like nothing else, and it remains like nothing else, despite her so selflessly and so inspirationally teaching her process to the world. What comes out of her heart, and her studio is a stand alone collection of art, in the sea of disposable, anonymous sameness rampant in the fashion world. All of her 3 prior books string together the complete story of her unique process of embellishment and construction, down to every last detail. What is particularly special is how her books offer such a sense of place, that absorbing the skills taught within them is that much more crystallized. And you finish the reading having experienced her process as much as you have read about it. If I could succinctly characterize this new book, it is that it graciously gives that extra mile of instruction that I would assume was never possible to do in a book. Instructing garment sewing from a book is tricky. But Natalie does it in a way that investigates the basics (and also every combination of altering those basics) with just the right amount of detail and technique to make it informative, but also with just the right attitude and encouragement to make it approachable. And just like her first three books, it is a stand alone compendium on style while being a reverent guide to the handmade. 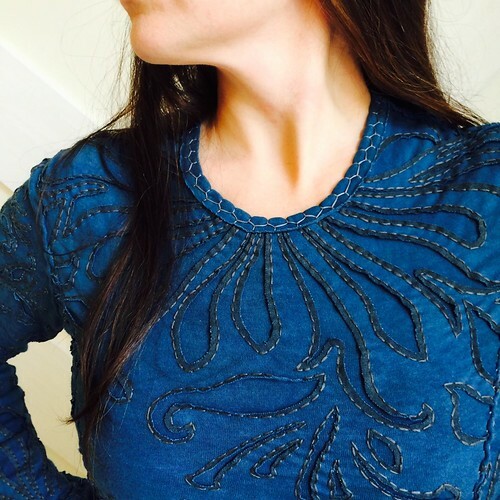 When it came time to choose a garment to have made, I just pointed to the amazing princess seamed long sleeve tee on page 51 made from indigo-dyed cotton and said THAT. I feel beautiful in it. But I also feel so very comfortable. Thousands of stitches made by a pair of talented, hardworking hands simply feels different than anything else you will ever wear. This post was meant to be published a full week ago, and in my hurried, frantic schedule of getting the doors to Craft South open, I failed to complete it on schedule. I texted Natalie to apologize, and her reply was such a comfort: "Nothing is ever late in our world". Thank you, Natalie. Thank you for your patience with your own process (and with me). You remain an inspiration, a friend, and a source of hope in the way that our world works. This book is the icing on the cake for your fans, and I am personally grateful that you took the time to make it. I should write. Without any prior plan to do so, I slipped out of bed when I heard Jeff clanking around and making coffee this morning, much earlier than usual. I was hoping that the remnants of subconscious thought would finally set to text and screen what has been swirling around up there for a few months. I have actually lied partially awake in bed very many early mornings and felt sure I have struck just exactly the order of how a piece of prose could go. I rise, drink coffee, plan and start the day and the opportunity simply dissolves. Just disappears and gets buried in all of the things that a day becomes, good or bad, neither. This scenario has repeated countless times. Today is different. Today is our eldest Juliana's birthday. 23. I was saying to Jeff last night that it doesn't seem any more or less than 23 years, it rather seems a whole other lifetime. A different time and place and group of characters all together. But I look back harder and see myself in that girl, swept from maidenhood to motherhood in just a few seconds. And I see him. Upright and filled with all the love necessary to carry us to here, without a map. And her. Beautiful and amazing to me now, then, and every single moment in between. As of the 22nd Nicolas is now 17 and as of the 20th Eleni is now 11. They are each growing into themselves which feels astounding to witness if you let yourself think about it. And what, Jeff and I wondered in the dark last night, is it that divides these other lifetimes ago that we sense. How does it happen without warning that a group of events or memories suddenly feel like another time and place? How does it partition itself from now? The cities. The houses. The arrival of children. The schools. How soon will it be before we look back on this time and label it another life? 2014 humbled me. I seldom feel an obligation to write here or anywhere, but just let things be what they are, never seeing any sense in forcing it. If most of my journaling these days comes more moment by moment on Instagram, then that is just how it is right now. No doubt it will eventually change again. I suppose that for me writing feels a luxury with all that is on my plate, and one I miss and haven't indulged myself in for a while. If I do have one regret it is not doing my year in review post for 2014. But it really felt like more of an incapability than a resistance. The whole year was filled with growth in my work and in my family, so many good things, but the last few months of it almost emotionally paralyzed me. In the span of one month, my oldest, dearest friend lost her husband suddenly and unexpectedly. My gorgeous, perfect dog Leo was hit and killed instantly by a car in front of our house. Isabela and I were in a car accident just ten days later. Completely my fault, I still don't know how I didn't see him coming. I do know that right as I was pulling out of our driveway, I was saying the words "I can't believe our Leo is gone, I miss him so much". Crash. If this blog has ever been a place to report my goings on, it stopped right there for a bit. I could not. I learned something very poignant recently. Studies have shown that the brain can not actually feel the emotions of anxiety and gratitude at the same time. They are opposites. So much so, that psychologists suggest writing down all the things you are grateful for each day as a way to get your brain on the healthier side. I found myself feeling anxious last year quite a bit. Of course with the loss and sadness, but even really good things that required so much of me, wore me out emotionally. I am grateful that my friend has family and friends to surround and love her and her gorgeous twins in these deep days of loss. I am grateful that my boy Leo did not suffer, and that a perfect stranger risked traffic and darkness and helped me in the middle of the road to carry him home, as Jeff and most of the children were gone. I am grateful we still have Cash puppy. I am grateful that the man driving the car who hit me was kind, not angry, mostly concerned about me, and that Isabela and I did not suffer too much banging up. I am grateful we had the means to fix our car. On the first day of this new year our house and trees were swarmed with a mumuration of starlings. The sound was overwhelming from the upstairs studio as it is just right under the roof. They were stunning. A chorus. A dance. The yard and trees were blackened by their presence. Here and gone in seconds. I think we are that way. From one tree to the next. 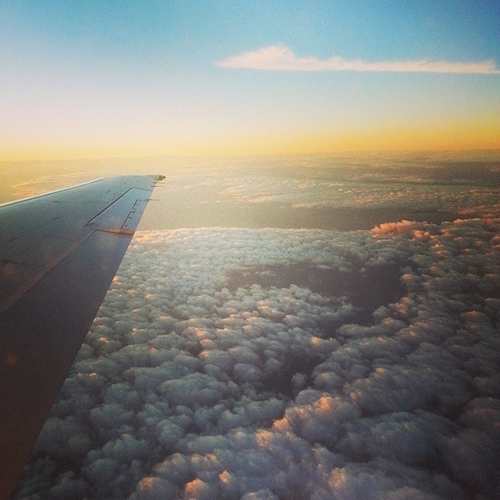 The same tribe flying high and low, straight and organized and then not. But moving and together, always. Wishing you a grateful 2015! Look forward to sharing it here with you. In classic form, the time of year that has me going in several different directions, mentally and physically, is also the time of year that I almost bonk into where I am headed due to being entirely distracted -transfixed- by the gorgeous thing that happens to Tennessee between October and November. It is that transition that seems to represent the humanness of nature. It burns and burns all summer, full force, exhausts itself, reflects softly on what it has managed, before settling in for a nap....finally being okay with letting things lie a little dull for the sake of a rest. I could benefit by taking such a suggestion. It is no secret that I have been over here on the blog less, a lot like the rest of the world and the rest of the world's blogs, maybe. I am able to get out so many small bits of my day to day words and images on Instagram that my sharing bucket gets filled up in smaller doses, rather than this more comprehensive dose. And I will admit that the addition of building Craft South, literally and figuratively, over these past months (and more to come) has placed some limits on my time compared to early in this year. 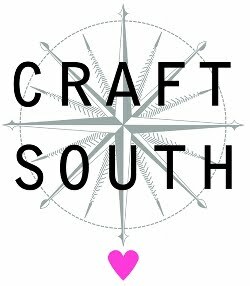 The Spring had us planning it all, the Summer had us doing the pop-up version month after month, and now we are almost to where we will be launching the online Craft South shop in just a few weeks. We hope for the actual physical shop to be open late March or early April. 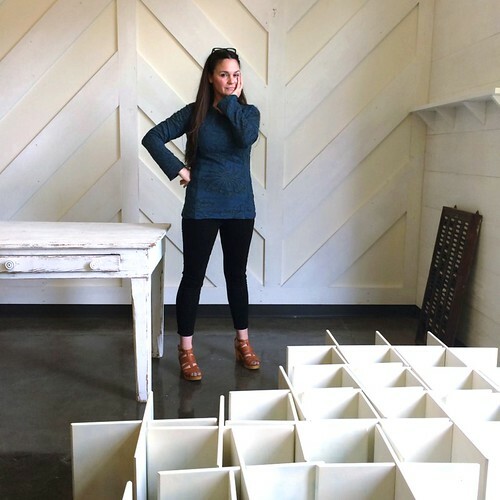 In addition to choosing all the inventory and ordering there is so much planning going on behind the scenes that involves all of the workshops/events we will host, space design, branding and packaging goodies, product development and so forth. In general I have about 8 massive lists. I think what I am loving so much about this process, despite the load of work, is that a whole lot of it is completely outside of myself and my own brand, and that it is requiring something new of me. 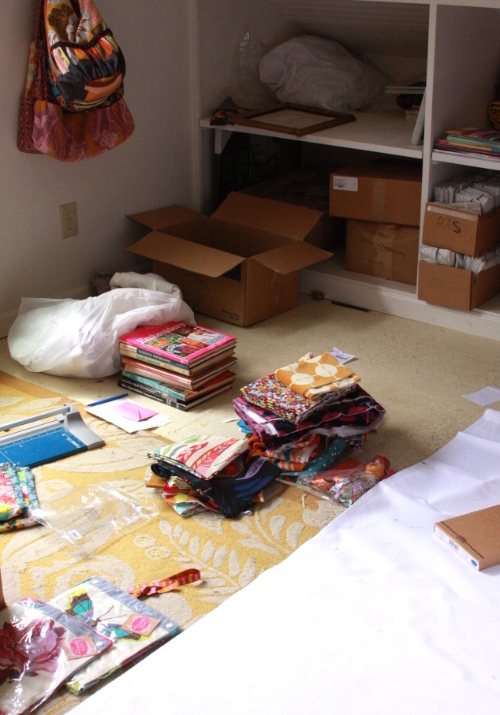 I am acting as a curator of other goods, and it is very gratifying as a lover of so many types of crafting and making. I love it. But yes, it is yet another job title. So. That's the short story. 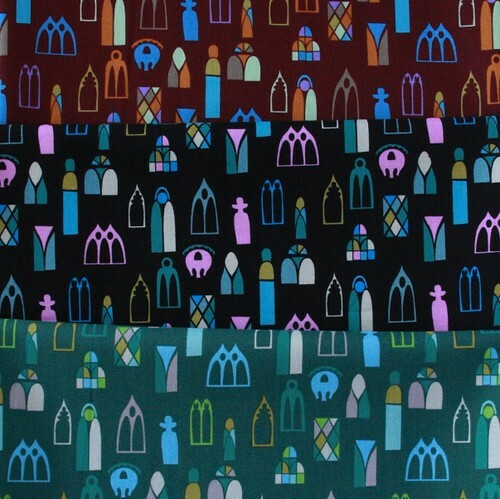 In other news I have new fabrics. 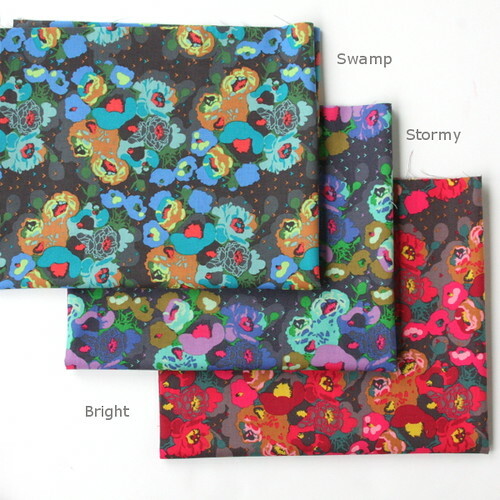 A new free quilt pattern. 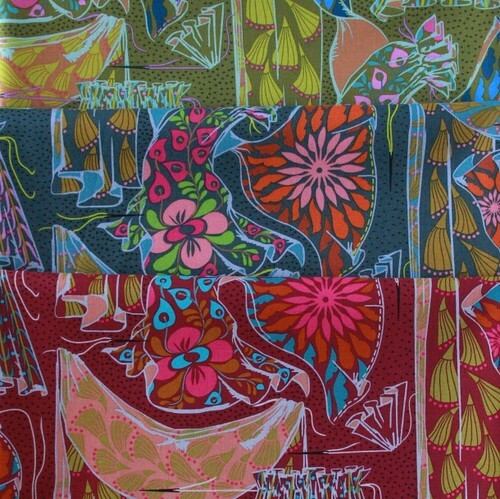 I am getting deep into work on my 2015 fall fabric designs for. I am knitting cables. I am trying to decode Mary Anna's babbles on a daily basis and wishing I had the amount of clarity in understanding them as she seems to have in her delivery. I am waiting everyday at the bus stop for Roman, and inhaling the smile he has for me as though it were oxygen. I am cutting Nicolas's very long hair today at his request. I have caught Joseph who just turned 15 telling Mary Anna how much he loves her when he thinks no one is listening. 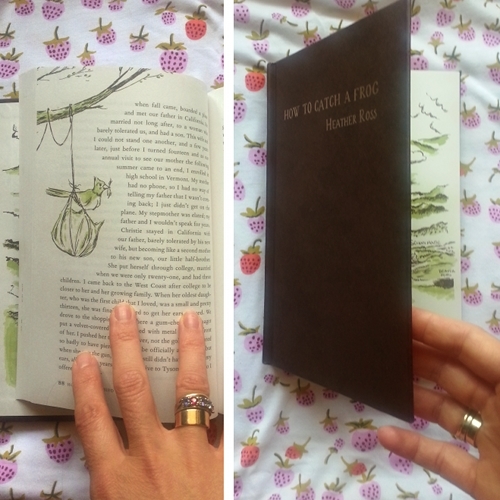 I am floored by the amazingness of this coloring book self-published by my Juliana. I laugh every time someone thinks that my 13yr old Isabela is my college graduate daughter. I am thankful that Eleni loves taking care of Mary Anna in the afternoons as much as both Mary Anna and I love her wanting to. And there were some rocks being thrown at my studio window over and over again the other day when the kids were playing out in the setting sun. As I looked down to shout at them to stop I found my boyishly charming husband standing there instead with a giant grin on his face. I cranked the window to say something sweet, but as soon as I could hear him singing "In Your Eyes" it was so ridiculously goofy that I just shook my head at him and rolled my eyes. Returning to my chair with a small jump I my heart and entirely smitten that he is willing to be that stupid for me still. 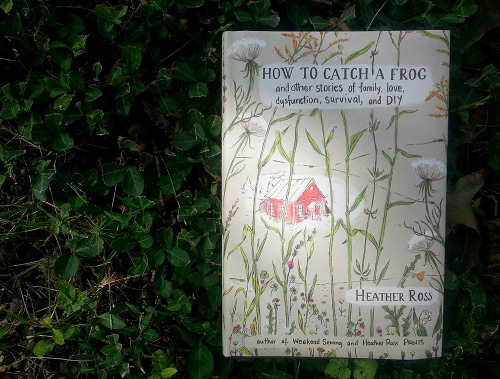 I need to disclaim that Heather Ross is a dear friend of mine, and that is a fact I only wish had not been true while I was reading this book, so as to maintain- even just for her sake- as objective an opinion as I could of this truly illustrative memoir of her less than typical upbringing. But I will get back to that. A good review removes oneself, so here we go then. This memoir of Heather's is shared from the perspective of a woman who has survived childhood- not a “normal” one if there is such a thing- but one where she and her sister manage to understand where they belong and what belongs to them for mere fleeting moments of their upbringing only to have the rules change on them again and again. In a broad stroke, Heather's style and her choice of vignettes keep you keenly interested on what happens next, have you watery-eyed both through laughter and through heartbreak, and have you as enthralled with the highly descriptive details of how she physically managed to survive her extreme, element-exposed childhood in rural Vermont as you are with her intensely lyrical and charming descriptions of the characters that populate this book- the characters that populate(d) her life. The timeline of the memoir is one that jumps around a bit, but not in a really deliberate or highly methodical way that becomes overly scheduled so that you are expecting the four pages of present tense right after you've read the four pages of past tense. The hopping around is organic- much like how you would remember something about your own life, which would generate the more recent or much older circumstances that would naturally be called to mind. In other words, it is crafted just like a story that you are listening to as if you were sitting next to her.... where the conversation takes turns as necessary to paint a full portrait of a person and their path to here. I ran into the bathroom and sat on the side of the tub, trying to hold back tears, my stomach and my chest pounding and aching. Jane opened the door and quietly sat next to me, her hand on my back. At first she said what she always said, trying to get me to smile, but I was past the point of needing just a cheerful chin-up. What I needed, at that moment, was for someone, just once, to tell me that I was right, that even though I was a child, I was right, that this thing that felt so unfair was, indeed, unfair, that what was happening to me- the mother who was barely holding on, drinking more and more, dragging me along on her poorly planned adventures- wasn't O.K. And Jane, for the first and only time in my life did that. She pulled me up onto her lap and held me as tightly as she could and told me that she loved me, and then over and over again, her voice cracking, she said just one thing. "I know," she said. "I know, I know, I know"
Upon opening them, she drove straight to the bank without even taking a minute to put on her shoes and deposited money into my account. I returned to California in the spring certain that it was possible to make a living as an artist but not having any idea how. I can honestly say, even from the perspective of someone who has heard a few of these stories- and even some of the back-back-stories to these from my friend Heather personally, that I was sad when it was over. It is such an entertaining, and ultimately honest read. You will be overwhelmed with the fulfillment of watching a talented, seasoned artist allowing herself an honest look back at her life- which I know was a very hard thing to do. She has inspired me to jot a bit more down as memories soar over my head unannounced. Not in sad ways, not in ideal ways, just in ways and with words that reflect exactly what I can remember. I think she might inspire you to do the same. There are so many more vignettes, including saving a couple of lives, meeting her husband after a string of people who would not do this lady (or any lady) any service as a husband, having her daughter, sprinkled with related DIY that concrete this book as something that will stay with you for a long time. I ended so entirely glad that she is my friend and so happy for her that she managed not only to get through her life until this point, but that she got through the very, very good writing of it as well. We are lucky for that. I love the book so much that I bought 3 dozen copies! But those are for the book signing that I am hosting for her at Craft South next week. 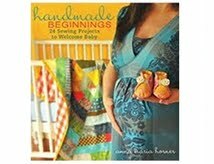 If you are in the area, stop over and visit with Heather and get your book signed! 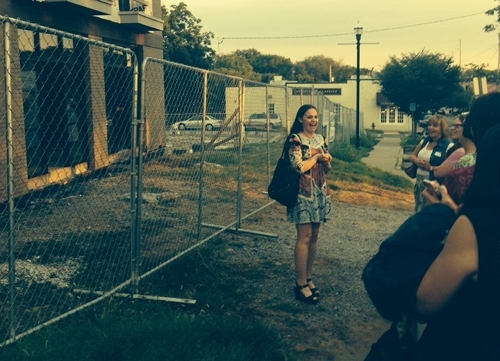 We have found the permanent, real, live, physical, perfect location for Craft South. I still can't believe it on so many levels. What started over 18 months ago as an itch to move my online shop fulfillment, and therefore employees, to a space outside of my home, has developed into a venture, that in my hope of hopes, is literally and metaphysically building a brick and mortar wall around everything that I have been doing my whole adult life. My name and that of my husband's is now signed on a lease for a building that is still in the process of being built in Nashville's most bustling neighborhood, 12th South. 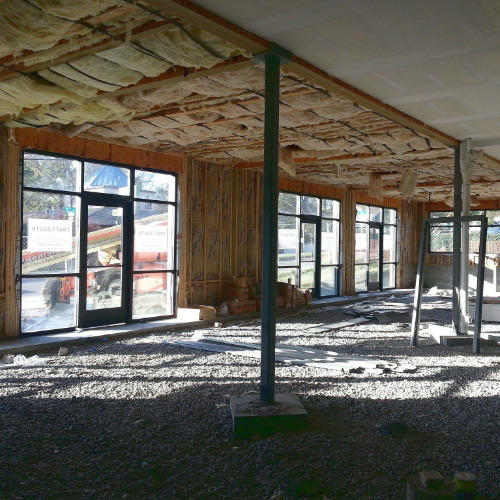 We hope to move in towards the end of the year, and be open for business sometime early in 2015. More about the project here. The pop-up style of how we have been running Craft South this summer, has brought to us some of the kindest, most talented, funniest, most diverse and interesting group of women & kids from all around the world who have had such a devoted enthusiasm for their craft of choice. Garments. Patchwork. Embroidery. Machine skills. Hand skills. What they all seem to have had in common more than anything is the desire to share and the desire to learn. Two things that I myself possess and work on every single day. In other words, I have somehow managed to bring kindred spirits to my home and create a place and a frame of mind where we are all bettering ourselves in a way that makes sense to us. That is me up there introducing the most recent group of weekend workshoppers to our shop in progress. I am a pretty lucky lady. Even luckier that I have been able to connect these ladies with amazing designers & friends like Amy Butler, Liesl Gibson, Natalie Chanin and, in just a couple of weeks, Heather Ross. I am thrilled that we will have a place to continue connecting crafters with those that inspire them and keep an open door policy with our neighbors who want to share, shop and learn. If you have ever read my about page, you might have noticed a note buried in there about how I got started in my career. I got started with my mom. We had a shop called The Handmaiden in Knoxville that formalized the trade that I had developed in college of earning extra money making and selling dresses to local shops. We decided to have our own shop and make lots more dresses right there in front of everyone. We also sold the wares and designs of about 40 different local artists, so I got to know independent designers (in the days before Etsy) and their hopes and struggles at the tender age of 23. Mom had just retired from nursing. Juliana was 3. Jeff was still in school. We set up sewing shop at the back of the space, I designed the clothes, we both sewed them, and we barely made enough money to cover rent some months but I have barely ever had more fun as I did those three years with my mother. Playing store, talking to customers, figuring out how to be a mother, wife and business owner all at once, but all with the help and care of my devoted mother. My biggest fan, my most earnest supporter. My partner. The running of the business and all of the challenges we faced soon overwhelmed my ability to devote myself to designing. When the designing suffered, I chose to rather run the clothing line out of my home for a few more years wholesaling around the Southeast. My mother had this unbelievable knack for being able to chalk up the entire experience as one where we learned a lot and that it was a total and complete success, simply because it headed me where I was going. She was so proud of me and continued to support every move I made in business and life until her last moments. We had prayerfully dedicated our shop to the Virgin Mary, as she is referred to in some scripture as the handmaiden, and my mother was always so thrilled that we happen to sign the lease for that (incredibly overpriced) building on August 15th. It is on this day that the Eastern Orthodox Church celebrates the Virgin, and all those named Mary, which my mother was, and therefore celebrate August 15th as their "nameday". I likely would have forgotten that signing date had it not been for my mother so continually bringing it up over the years, and what a blessing it was to our experience. That was her. Always a good reason for everything. There was a glimmer on every bit of life if you looked hard enough, even those that I might have labeled as failures. She saw glimmers. 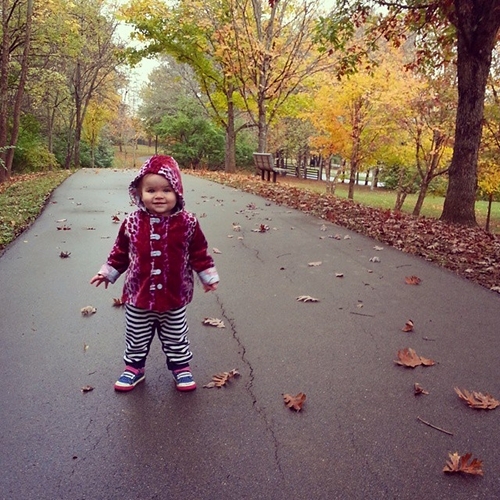 This new life I have- the one where she is not here, I am still figuring it out. When good things happen these days, particularly the ones that I don't expect.... the glimmer feels like her. It feels like she is arranging things for me. True or not, it is a comfort. And this new place. This (incredibly overpriced) building - I have been working continually to be the tenant there since February. It was a long and complicated and imperfect process that was filled with doubt, frustrations and high hopes and a huge investment of time beyond my everyday responsibilities. The process took so much longer than anticipated. We were set to sign in mid July. Things got sticky with negotiations and it moved to early August. Then we were set to sign on August 11th. The lawyers were out of town so the date moved to August 15th. And that is the day that this venture started. On mom's nameday. Again. This time, 19 years later, it was our little Mary Anna's nameday too, and we celebrated her. Just the day before we signed the lease I taught the kid's hoola hoop weaving class and a very sweet woman brought her daughter to take my class. Before class got started I had a nice chat with the mom about craft, Nashville, parenting, school and how the city is growing. Later that night once settled in with my laptop, husband and a movie I got an email from that mom. She said it was not until after she had been in class with me and her daughter that she realized that I am the same lady that had a shop in Knoxville where she used to spend some time between classes while at UT. She said she remembers that I owned it with my mom who was such a sweet lady with whom she enjoyed speaking. I simply replied that hearing that gave me a lot of joy and what a small world. We are beginning this adventure with a million little glimmers. Some of them hard work, some of them prayers, some of them art, some of them stitches and some of them are you. Thank you so much for any bit of help, encouragement, purchases, notes or thoughts you have lent to my process as a designer over the years. They have all brought me to a place- a physical one that I will gladly walk into and I hope to see you there. ps. 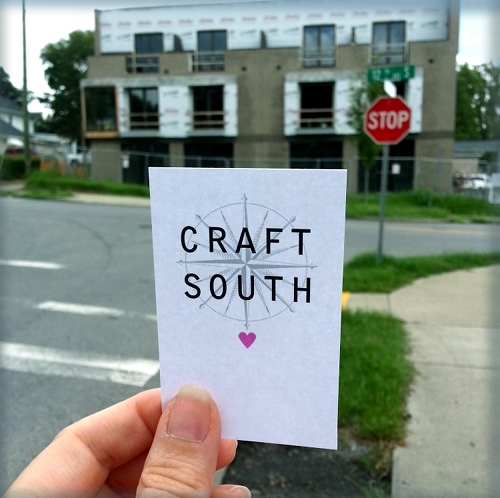 keep an eye on the Craft South instagram feed for updates as we have them and the Craft South blog.